If ITER were an ordinary project, like the building of a bridge, the construction of a highway or even the launching of a satellite into space, it would be relatively easy to know its state of advancement. So much work done, so much money spent ... a simple extrapolation would indicate the percentage of completion. ''Basically, at any moment, we can answer the question of where we stand in regard to our objective of First Plasma in 2025,'' says Colette Ricketts (second from left), the Deputy Head of ITER Project Control Office. But ITER is nothing like ordinary. Not only is it big, complex and international ... but it is also a one-of-a-kind project, spanning several decades, with a unique form of organization. "The complication, when it comes to monitoring the project's global progress, comes from the nature of the seven Members' contributions," explains Colette Ricketts, the Deputy Head of ITER Project Control Office. Although complex to manage, this "formula" is highly beneficial for the Members' industries which, by responding to ITER's challenging requirements, acquire knowledge and skills that can boost their competitiveness. In order to manage the in-kind contributions of the seven Members, each with its own national currency, exchange rate fluctuations and labour costs, an ITER-specific Unit of Account (IUA) was developed in the early 1990s. Each component, system, building or task was assigned an IUA value. It was agreed that every Member would contribute approximately 9 percent of the total project value in IUA, with the exception of Europe which, as host would contribute approximately 46 percent. With this system in place and a common currency established, the ITER Organization could monitor project progress based on the IUA value of the tasks performed as reported by every Domestic Agency. "We do not know how much a Domestic Agency actually pays a given contractor to perform a task," adds Colette. "However, by assigning a value in IUA to every completed task, we are able to assess ITER progress." The huge amount of work required to build the ITER installation is broken into some 18,000 different tasks—some large, like the fabrication of a toroidal field coil winding pack, and some smaller-scale like the testing of a gyrotron or the finalization of a manufacturing review for coaxial cables.... All are listed precisely in a database called the Master Schedule. 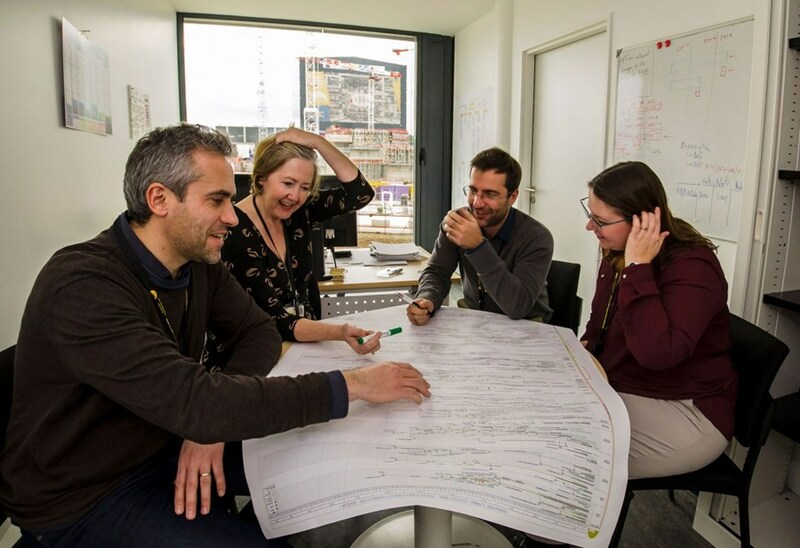 On the fifth day of every month, the Project Control Office receives a Detailed Work Schedule (DWS) from every Domestic Agency and the ITER Organization (for the tasks it is responsible for). This starts the process that, along with discussions and video conferences with responsible officers, provides an instant photograph of the status of the ongoing works throughout the ITER world. It is this information that is used to keep the Master Schedule up to date and, once compounded and treated with the appropriate algorithms, allows the Project Control Office to report on overall progress. "Maintaining the Master Schedule is our number one mission because the updated information it contains is indispensable for the execution of good management decisions," says Colette. "Basically, at any moment, we can answer the question of where we stand in regard to our objective of First Plasma in 2025." In late November 2017, design activities (which account for 24 percent of all the work required to reach First Plasma) were 93.9 percent finalized; manufacturing and building construction (48 percent of the scope) was more than half-completed (54.2 percent); delivery (8 percent of the scope) was close to the 23 percent mark and assembly and installation (20 percent of the scope) was nearing 1 percent. The algorithms churned and turned and the Master Schedule could speak its oracle: ITER had achieved 50.9 percent of total work scope on the way to First Plasma.